In hope of continuing the celebration of our 2 year anniversary I come bearing gifts. Just so happens to be a track that Cool Chris has blessed us here locally with for some time now. Well, I've finally got my hands on one and now I'm giving it to you. On the surface, its a great funk track, almost a bit typical sounding in it's formula. Definitely a monster of a funk tune. But, once it reaches the crescendo and the backing vocals take those 'sunshine' harmonies you'll realize there's more to it. Sweet horns and some jazzy almost fretless sounding guitar riffs contribute to making this more than your average funk 45. It's a bit jazzy and just the right touch of sweetness. 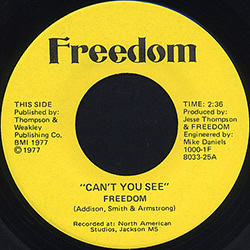 'Sunshine' is the flip side to 'Can't You See' by Freedom on what seems to be their own label. Don't think this group had any other releases and never got a chance to record a full LP. Just a great little tune. Big thanks to Cool Chris for banging this one out whenever he plays records.